As ancient fossil forests are unearthed, scientists gather clues about nascent plant life and the prevailing climatic conditions of the time. Fossilized forests discovered around the world, dated as far back as 380 million years ago, provide insights into Earth's ever-changing atmospheric composition and the corresponding climate changes on Earth. During the Devonian some 420 to 360 million years ago, the atmosphere underwent a 15-fold decline in carbon dioxide. The decline is thought to be primarily attributable to carbon sequestration caused by the evolutionary emergence of large forest trees. Carbon sequestration rates vary by forest age, composition, and location, but today we know that a single tree can absorb carbon dioxide at a rate of 48 lb. per year. The decline in atmospheric carbon during the Devonian period is posited to have spawned large-scale global cooling that led to a period of glaciation. 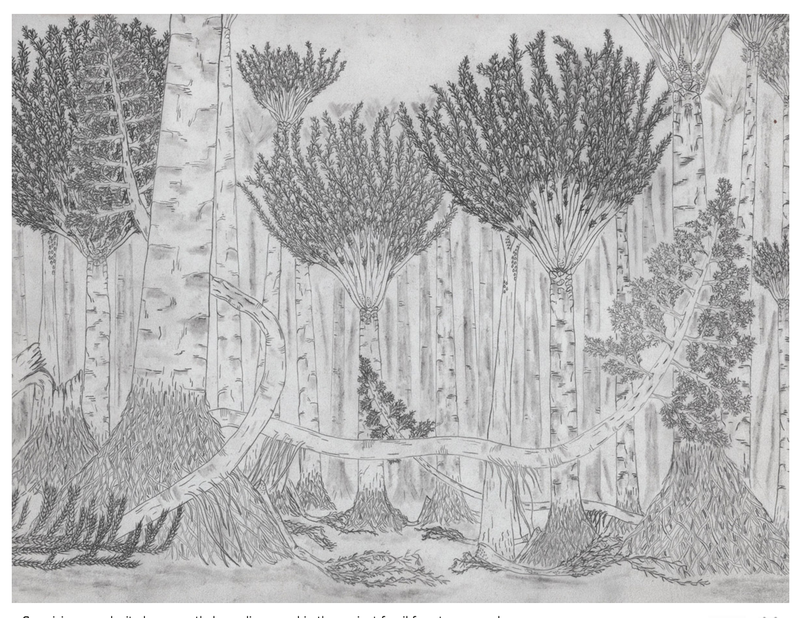 Fossil plant-life discovered in Schoharie County, New York in the 1850s, in 1920, and again in 2010, included the Gilboa stumps cited as Earth's oldest trees. It was like discovering the botanical equivalent of dinosaur footprints. But the most exciting part was finding out just how many different types of footprints there were. The newly uncovered area was preserved in such a way that we were literally able to walk among the trees, noting what kind they were, where they had stood and how big they had grown." Researchers have unearthed another forest with fossilized tree stumps preserved in place in Svalbard, a Norwegian archipelago in the Arctic Ocean. 380 million years ago, Svalbard was located near the equator. Since the Devonian period, plate tectonics has transported Svalbard to its current location in the arctic ocean. "These fossil forests shows us what the vegetation and landscape were like on the equator 380 million years ago, as the first trees were beginning to appear on the Earth." By the phenomena of carbon sequestration, trees absorb structure-forming carbon from atmospheric carbon dioxide through photosynthesis. "The evolution of tree-sized vegetation is the most likely cause of this dramatic drop in carbon dioxide because the plants were absorbing carbon dioxide through photosynthesis to build their tissues, and also through the process of forming soils." Svalbard is also in the forefront of preserving plant diversity. One of the northernmost inhabited villages on Earth, Svalbard is the site chosen by the Norwegian government in 2008 for the Global Seed Vault. Secured in the permafrost, the Svalbard seed vault is the largest seed storage in the World. Ancient fossil forest unearthed in Arctic Norway, Phys.org, 19 November 2015. Cardiff uni researchers help unearth ancient forest, BBC News, 19 November 2015. Evangeline, A Tale of Acadie, Henry Wadsworth Longfellow, 1847. Floor of Oldest Forest Discovered in Schoharie County, NY, New York Geological Survey, 1 March 2012. Lycopsid forests in the early Late Devonian paleoequatorial zone of Svalbard, Christopher M. Berry1 and John E.A. Marshall, Geology, 19 November 2015. Svalbard Global Seed Vault, Norwegian Government, February 2008.